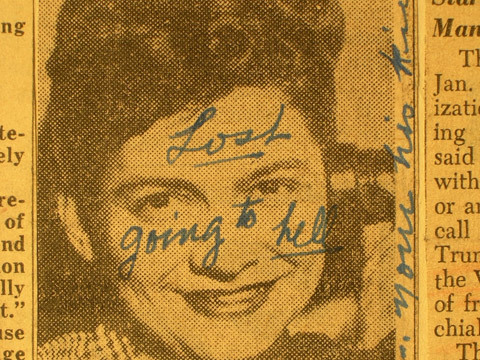 She was called “that awful woman” by her neighbors and “that atheist mother” by virtually every newspaper in the country. Her friends stopped returning phone calls rather than risk speaking with her. She was branded a Communist, and the Illinois State Legislature nearly outlawed her and her husband from ever working at the state university again. She received up to 200 letters a day, some of the writers claiming they would pray for her; many wishing for much worse. All because Vashti McCollum, a young mother of three from a small central Illinois town, filed a historic lawsuit in 1945 that would profoundly change the relationship between religion and public schools in America. The Lord Is Not On Trial Here Today tells the compelling personal story behind one of the most important and landmark First Amendment cases in US history, the case that established the separation of church and state in public schools. The film recounts a time that Vashti McCollum later described as “three years of headlines, headaches, and hatred,” but which eventually led to a decision that still resonates in the church-state conflicts of today, sixty years after the original decision in McCollum vs. Board of Education. Jay Rosenstein is a three-time Emmy award-winning independent documentary producer, director, writer, and editor whose work has been seen nationally on the PBS series P.O.V. and Independent Lens, the ABC World News, ESPN, the Nickelodeon Channel, the Independent Film Channel, and film festivals worldwide, including the Sundance Film Festival. His work includes the documentaries The Amasong Chorus: Singing Out, which aired on the national PBS series Independent Lens in 2004 and won a Documentary Award of Excellence from the Broadcast Education Association and a CINE Golden Eagle, and Erased, which premiered at the Sundance Film Festival. His best-known, ground-breaking documentary, In Whose Honor? American Indian Mascots In Sports, aired nationally on the PBS series P.O.V., was nominated for a Peabody Award, and was recognized by the Columbia University Graduate School of Journalism as one of the most outstanding programs on race in American television in 1997-98. In Whose Honor? is also being used as an educational resource in more than 500 colleges and universities nationwide and in Canada.